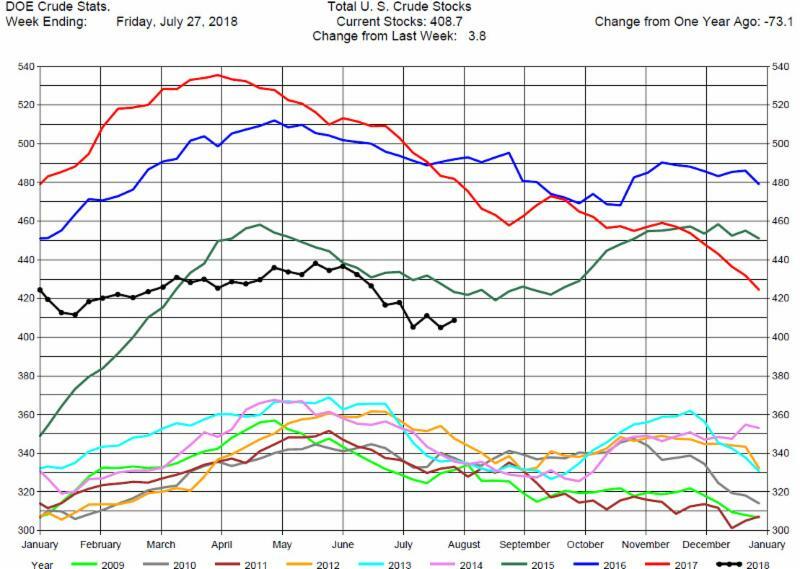 The DOE reported Total Crude Oil Inventories increased by 3.8 million barrels to 408.7 million barrels for the week ending July 27, 2018, expectations average was for a 2.8 million barrel decrease. 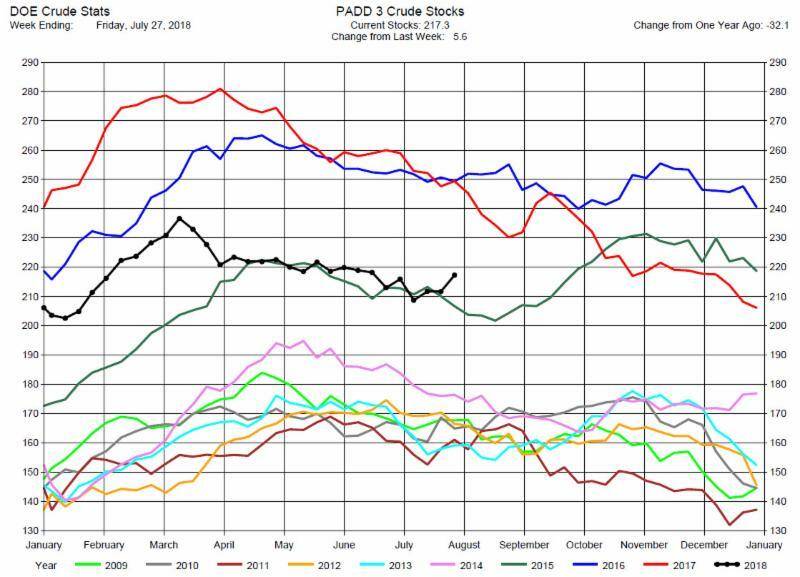 However, we should note that PADD 3, the Gulf Coast major refining region, was the only PADD to have a build, 5.6 million barrels, while the other 4 PADDs had draws. Overall hydrocarbon supplies increased by 10.6 million barrels to 1,207 million barrels. 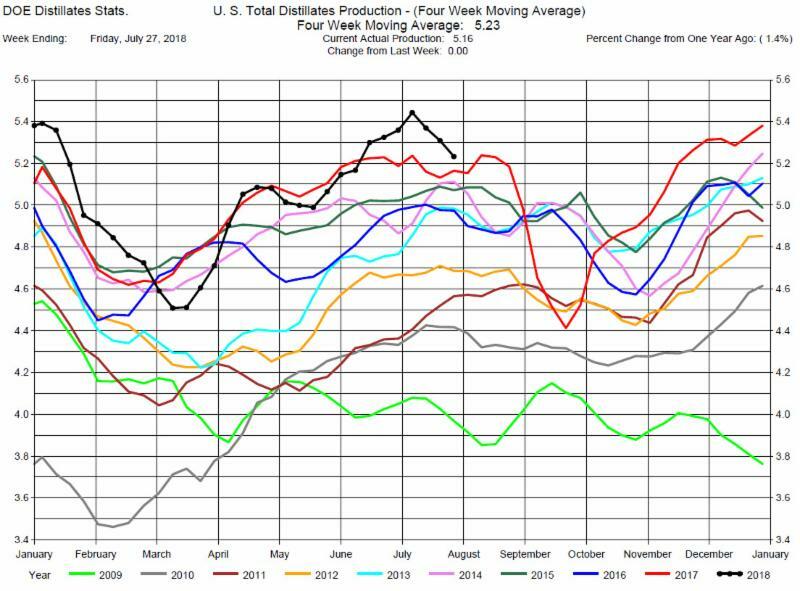 Crude Oil Production was off slightly by 100,000 barrels per day at 10.9 million barrels per day. 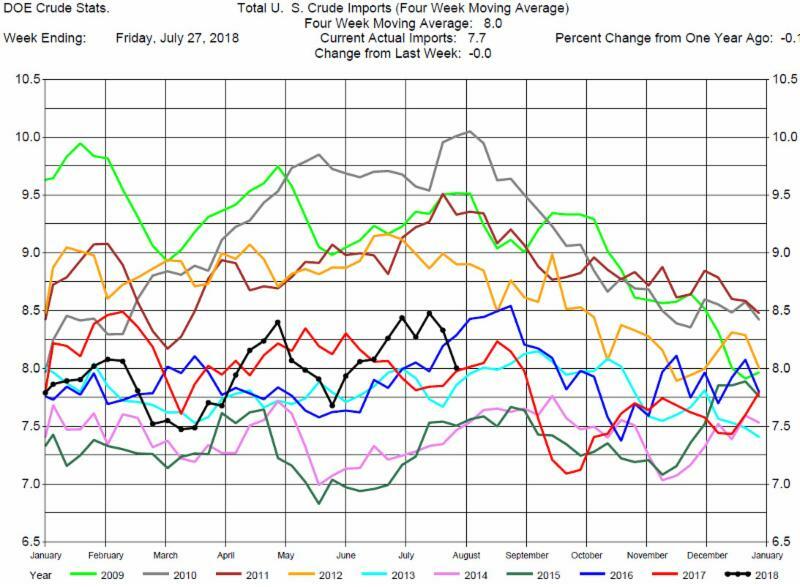 Total Crude Imports were unchanged at 7.7 million barrels per day. 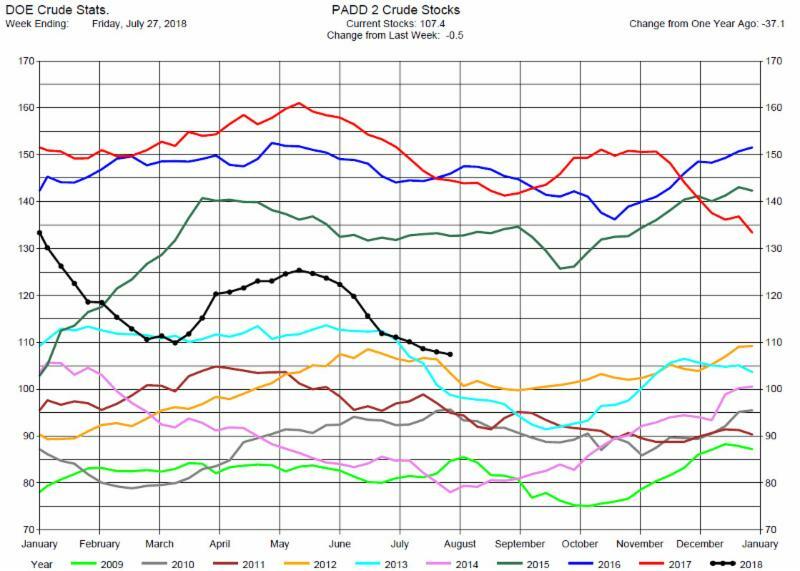 Most of those imports went to Gulf Coast region, PADD 3. 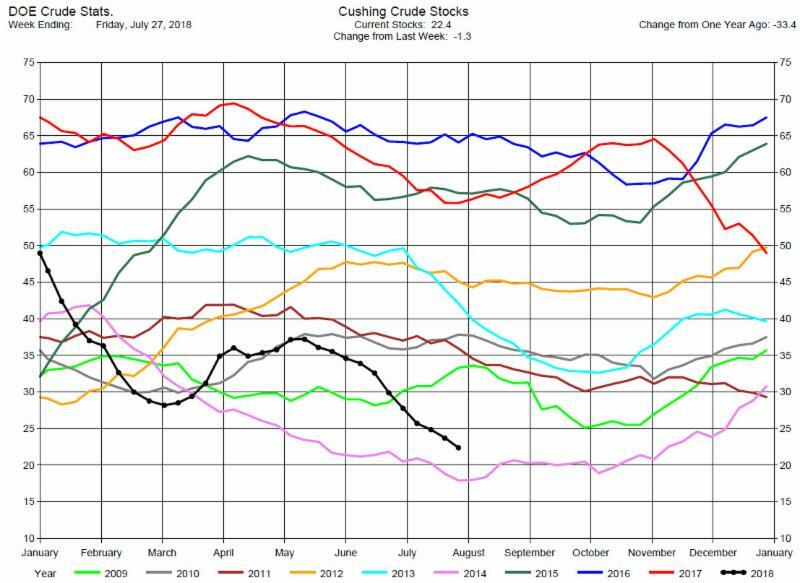 Total Refinery Crude Runs were up 200,000 barrels per day at 17.48 million barrels per day. 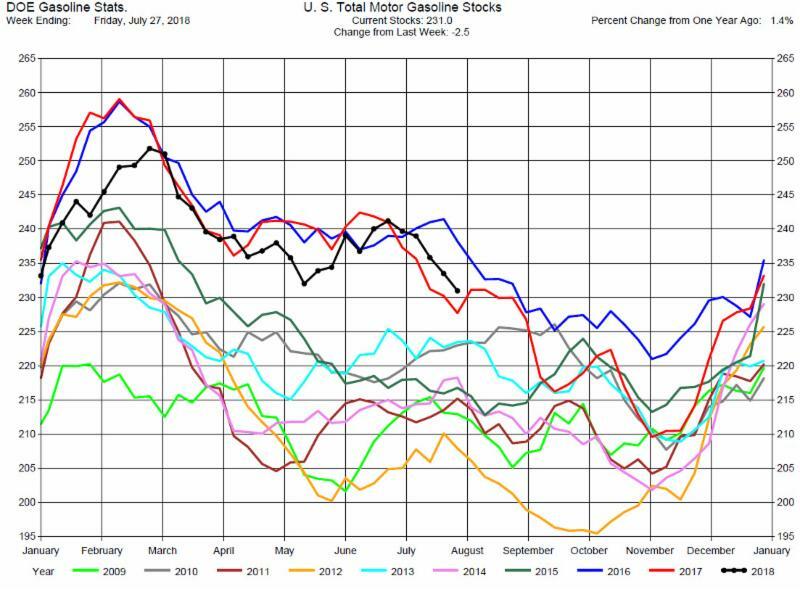 The DOE report was bearish for Crude Oil prices. Yet the market initially rallied 60 cents after the release of the report. 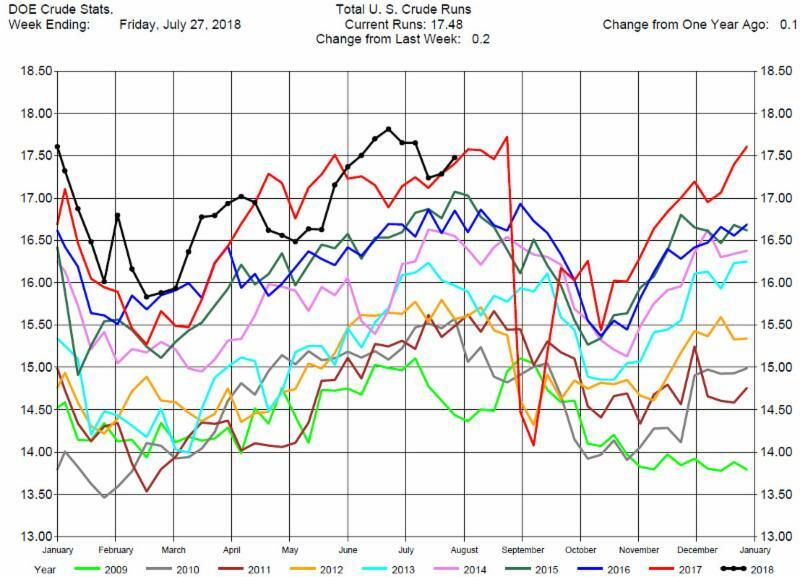 Crude Oil prices were choppy throughout the day, ending near the lows, settling near $67.50 Prices now appear to be in a range bound trading market. The market often reacting to geo-political events or announcements. The price range is from $64 to $73. Range bound trading markets are difficult to trade. We would recommend not taking positions in the near term and wait until a confirmed price direction is established. 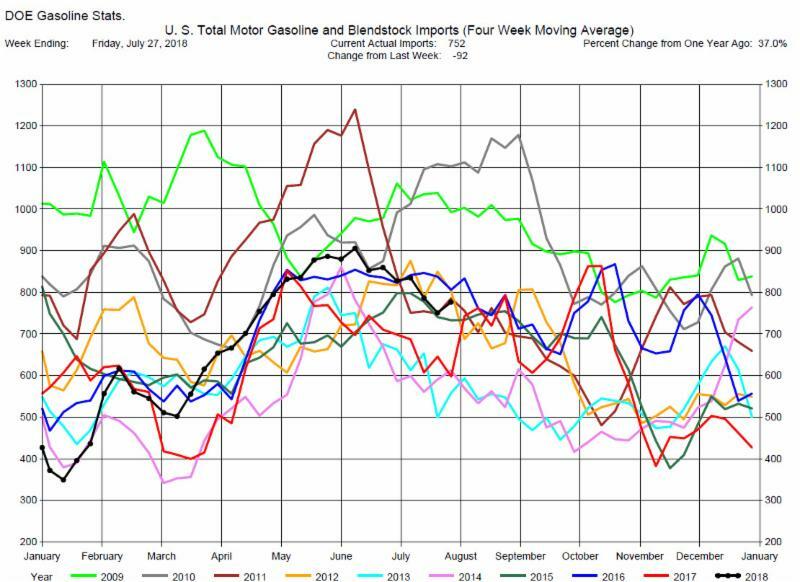 Total MotorGasoline Inventories decreased by 2.5 million barrels to 231.0 million barrels for the week ending July 27, 2018, expectations average was for an 1.3 million barrel decrease. Implied Demand was up by 110,000 barrels per day to 11.60 million barrels per day, a new record high. 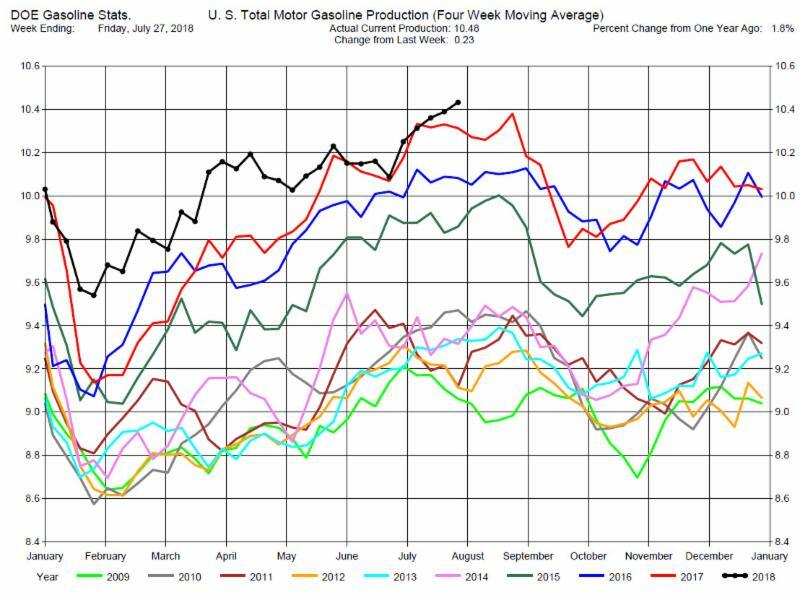 Gasoline Production was up 230,000 barrels per day to 10.48 million barrels per day. 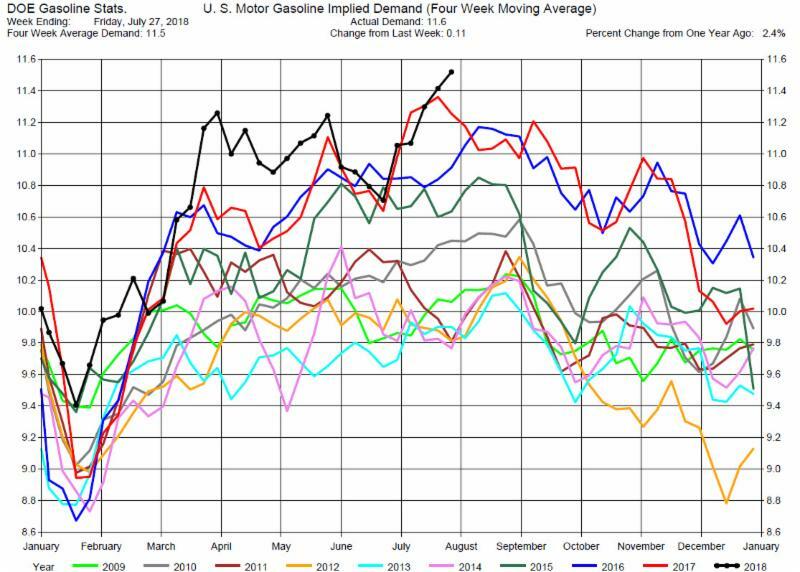 With Gasoline Inventories continuing their seasonal decline, Gasoline Demand at record levels, and Imports dropping, we still view this as a bullish scenario for prices. Crack spreads and calendar spreads are improving so we suggest considering long positions in the cracks or calendar spreads. 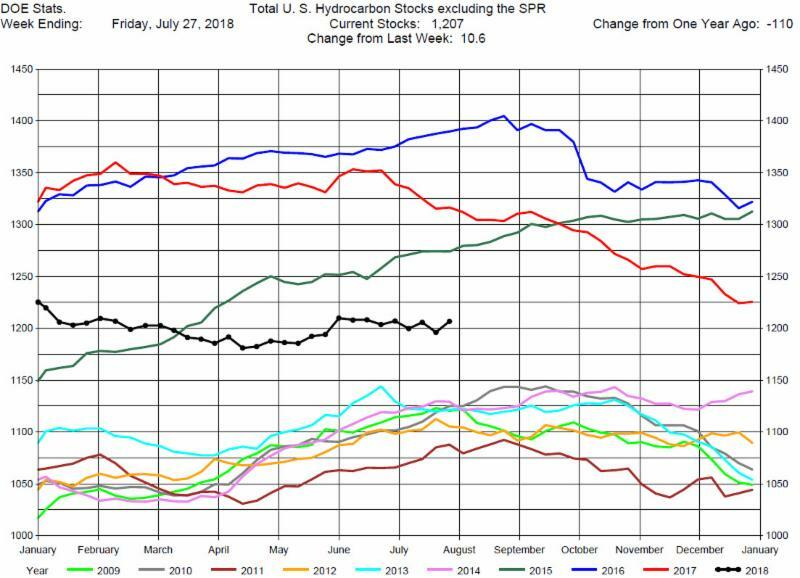 Total Distillates Stocks increased by 3.0 million barrels to 124.2 million barrels for the week ending July 27, 2018, expectations average was for an 264,000 barrel increase. 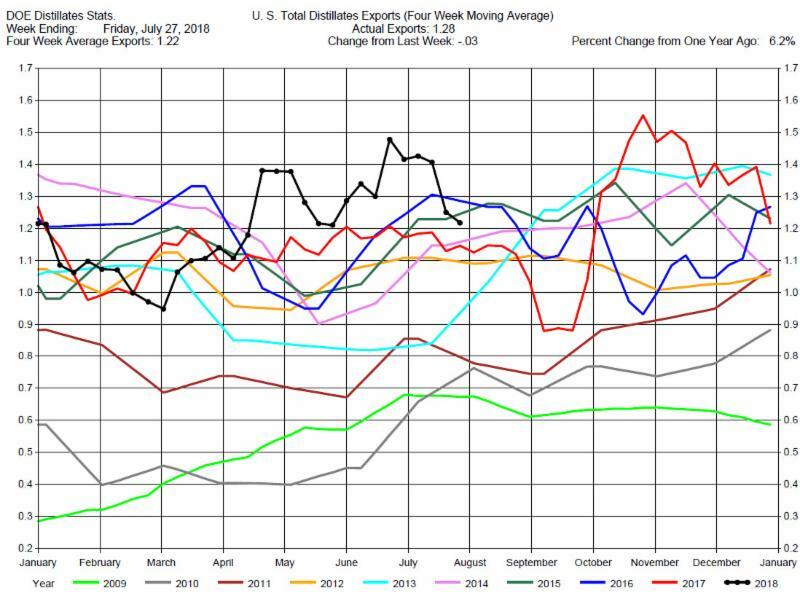 Total Distillates Production was unchanged at 5.16 million barrels per day. 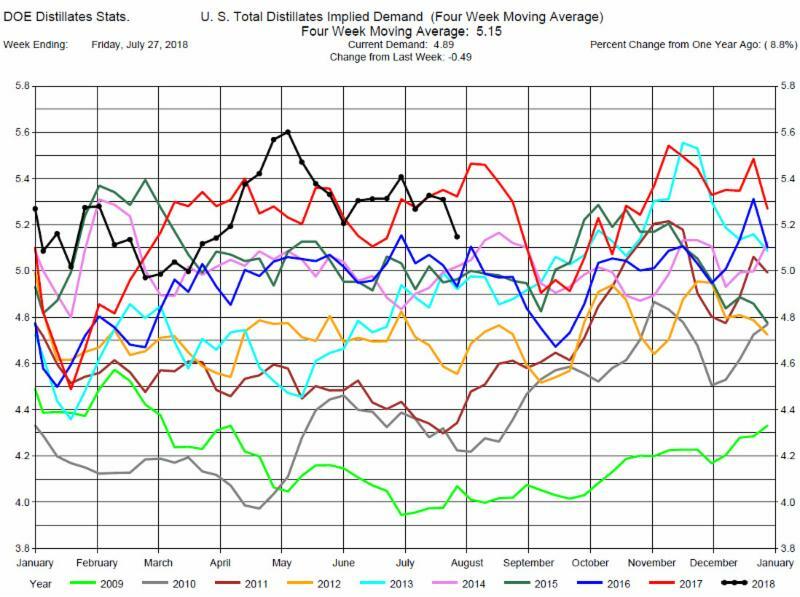 Total Distillates Implied Demand dropped by 480,000 barrels per day to 4.89 million barrels per day. 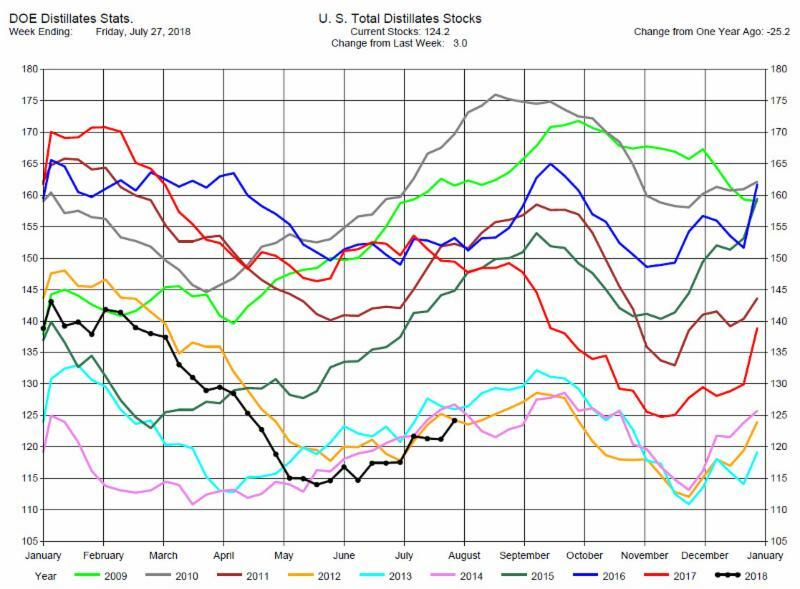 Distillates Demand has been strong enough to keep Distillates Stocks at seasonal lows, despite record level Distillates Production. We still view this as a bullish scenario and suggest traders consider Heating Oil cracks or calendar spreads as a bullish opportunity.